Cavium unveiled its 64-bit ARM-based ThunderX2 processor for servers in cloud data centers used for workloads such as compute, security, storage, data analytics, network function virtualization (NFV) and distributed databases. The second generation ARM processor from Cavium, which offers a number of on-board accelerators and advanced capabilities, packs up to 54 cores, enabling it to deliver two to three times the performance across a wide range of standard benchmarks and applications compared to ThunderX. It is built in 14nm FinFET process and is compliant with ARMv8.2 architecture as well as ARM's Server Base System Architecture (SBSA) standard. 2nd generation of full custom Cavium ARM core: 2.4 to 2.8GHz in normal mode, Up to 3 GHz in Turbo mode; > 2X single thread performance compared to ThunderX. Up to 54 cores per socket delivering 2-3X socket level performance compared to ThunderX. Cache: 40K I-Cache and 64K D-cache, highly associative; 32MB shared Last Level Cache (LLC). Single and dual socket configuration support using 2nd generation of Cavium Coherent Interconnect with > 2.5X coherent bandwidth compared to ThunderX. System Memory: 6 DDR4 memory controllers per socket; Dual DIMM per memory controller, for a total of 12 DIMMs per socket. Full system virtualization for low latency from virtual machine to IO enabled through Cavium virtSOC technology. Integrated PCIe Gen3 interfaces, x1, x4, x8 and x16 support. Integrated Hardware Accelerators: OCTEON style packet parsing, shaping, lookup, QoS and forwarding; Virtual Switch (vSwitch) offload; Virtualization, storage and NITROX V security. ThunderX2_CP: Optimized for cloud compute workloads such as private and public clouds, web serving, web caching, web search, commercial HPC workloads such as computational fluid dynamics (CFD) and reservoir modeling. This family supports multiple 10/25/40/50/100 GbE network Interfaces and PCIe Gen3 interfaces. It also includes accelerators for virtualization and vSwitch offload. ThunderX2_ST: Optimized for big data, cloud storage, massively parallel processing (MPP) databases and Data warehousing workloads. This family supports multiple 10/25/40/50/100 GbE network interfaces, PCIe Gen3 interfaces and SATAv3 interfaces. It also includes hardware accelerators for data protection/ integrity/security, user to user efficient data movement. ThunderX2_SC: Optimized for secure web front-end, security appliances and cloud RAN type workloads. This family supports multiple 10/25/40/50/100 GbE interfaces and PCIe Gen3 interfaces. Integrated hardware accelerators include Cavium’s industry leading, 5th generation NITROX security technology with acceleration for IPSec, RSA and SSL. ThunderX2_NT: Optimized for media servers, scale-out embedded applications and NFV type workloads. This family supports multiple 10/25/40/50/100 GbE interfaces. 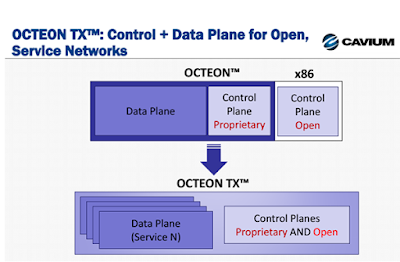 It also includes OCTEON style hardware accelerators for packet parsing, shaping, lookup, QoS and forwarding. "ThunderX2 combines our next generation core that will deliver significantly higher single thread performance with next generation IO and hardware accelerators to provide a compelling value proposition for the server market and greatly expand the serviceable server TAM," said Syed Ali, President and CEO of Cavium. "ThunderX2 will enable flexible, scalable and fully optimizable servers for next generation software defined data centers."